Cheap flights from Budapest to Hong Kong from €363 roundtrip! Air China (Star Alliance) or Air France-KLM (SkyTeam) offer competitive solution from Hungary to Hong Kong. Return flights from Budapest are available already for €363 (Air China) or from €379 (Air France-KLM). In both cases this is for a roundtrip ticket. Fare is including all taxes, onboard meals and checked luggage. Note that the cheapest option with Air China requires additional stop in Minsk on the way back. Both promotions with Air China and Air France/KLM are valid from September to beginning of December 2019. Fare class with Air China is “L“. Fare class with Air France-KLM Feeder / Intercontinental flight is “L , X or V“. Min. stay 7 days. Max stay 3 months. Both discounts are valid for bookings made by end of May or until the cheapest seats last..
We recommend you firstly compare the cheapest flights via Google Flights (Guide). Works for Air France deal only. The tool gives you almost instant result and you can easily browse throughout all the months. You can then book this deal directly with Air China or Air France-KLM or your preferred booking agent. If interested in this offer you can refer to our booking samples below. 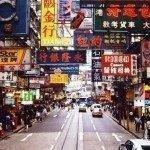 You can book your accommodation in Hong Kong via Booking.com. Also you can further discount your hotel when using one of following promo codes. Booking sample of cheap flights from Budapest to Hong Kong from €363 roundtrip! In this case you would depart from Hungary to China on Friday, 15th of November. Inbound from Hong Kong back to Budapest on 29th of November 2019.